It has become a requirement in several of our applications to merge PROV documents. 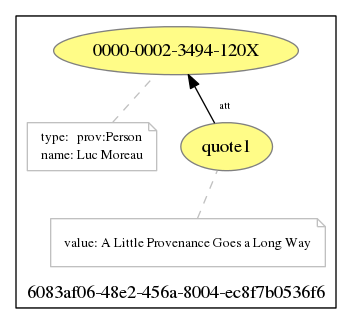 The purpose of this tutorial is to explain how ProvToolbox allows documents to be merged, ensuring that descriptions are uniquely represented with all their attributes, merging bundles they may contain, and optionally “flattening” them. This functionality is directly available from the command line using provconvert. 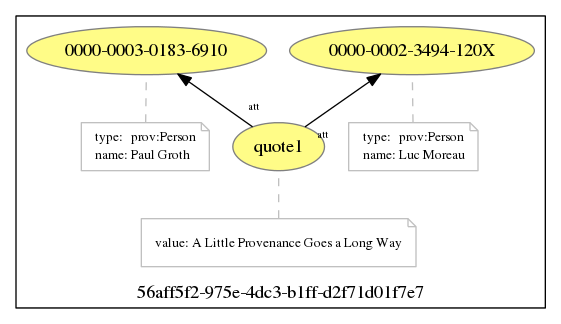 The tutorial is standalone and a zip archive can be downloaded from the following URL: http://search.maven.org/remotecontent?filepath=org/openprovenance/prov/ProvToolbox-Tutorial3/0.7.0/ProvToolbox-Tutorial3-0.7.0-src.zip. The tutorial can also be found on the ProvToolbox project on GitHub. 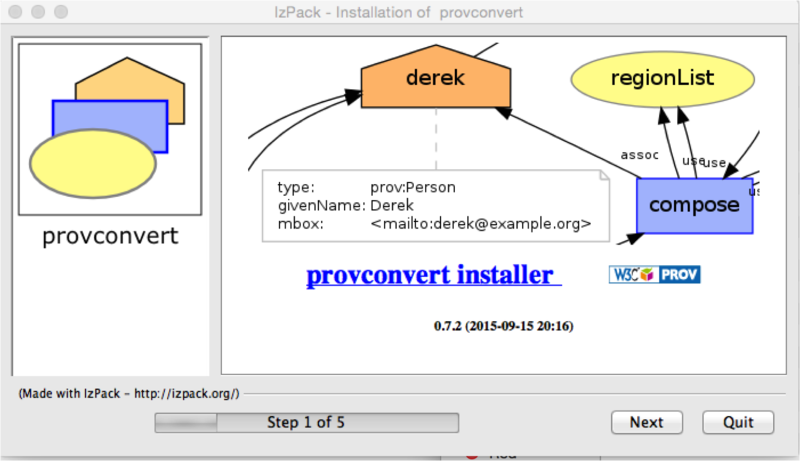 The tutorial assumes that provconvert has been installed and is available in the execution path. Our first example consists of two documents. The first document “doc1” consists of the attribution of an entity e1 to an agent ag1. 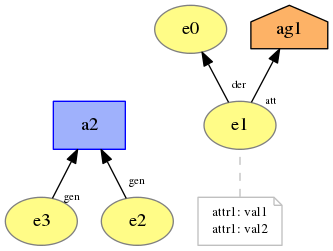 The entity has an attribute attr1. 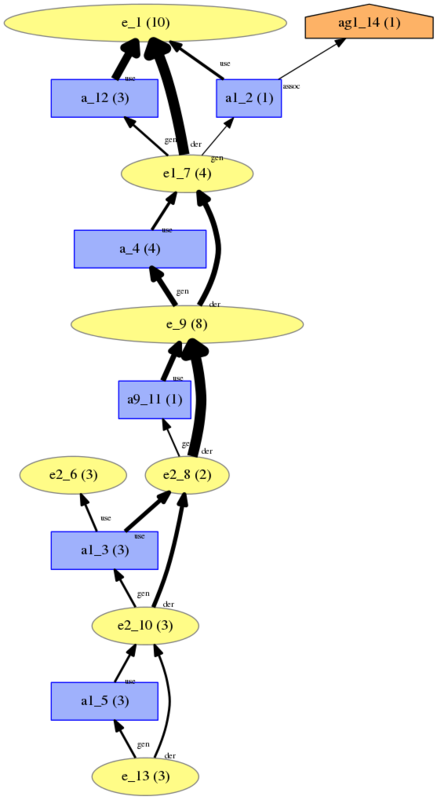 The second document “doc2” describes the derivation of the same entity e1 from another entity e0. The description of the entity e1 contains an attribute attr2. 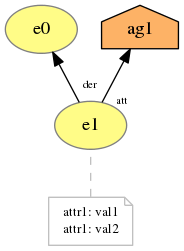 By merging the two documents, we obtain a new document, in which the entity e1 is both attributed to ag1 and derived from e0. 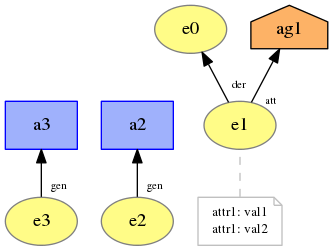 The description of e1 contains the attributes attr1 and attr2. Merging the two documents is simply performed by calling provconvert with argument -merge as follows. 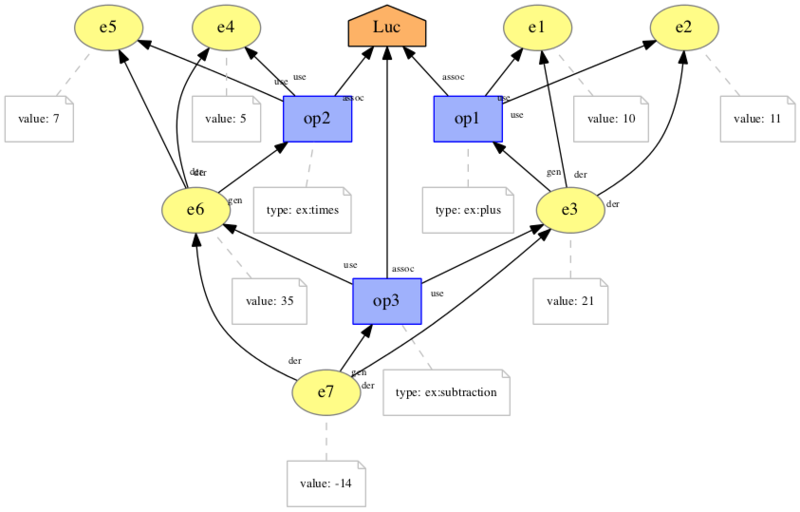 The merge operation follows key constraints of the PROV-CONSTRAINTS specification, such as key-object (constraint 22) and key-properties (constraint 23). 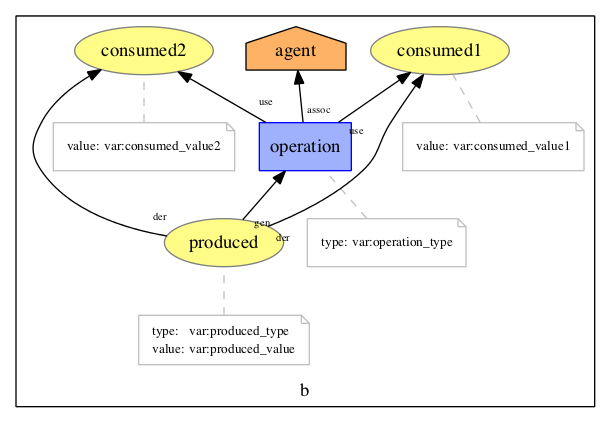 The reader who is familiar with the RDF representation of PROV will note that the merge operation is simply obtained by “concatening” all the RDF files together. The merge operation becomes interesting in the presence of bundles. First, we consider two documents with distinct bundles. 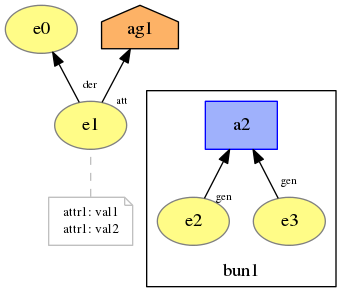 We now examine a variant of “doc1”, which contains a bundle bun1. 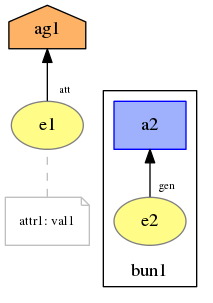 In the illustration, the bundle is represented by a rectangle, which contains a description of e2 generated by a2. The second document is a variant of “doc2” with another bundle named bun2. It contains a description of e3 generated by a3. After merging the two documents, we obtain a new document containing both bun1 and bun2. As we can see, as the two bundles have different names, they are kept distinct in the merged document. Concretely, the first document with bundle bun1. The first document with bundle bun1. We can optionally use the -flatten option to “remove” bundles, and “pour” their content in the surrounding document. 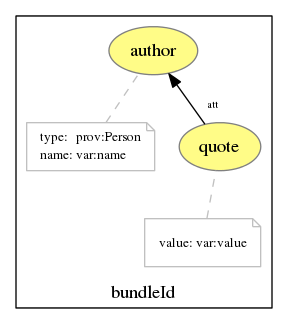 The resulting document no longer contains bundles. Now, let us consider a variant of “doc2” with a bundle bun1, the same identifier as the bundle we had in the “doc1” variant. 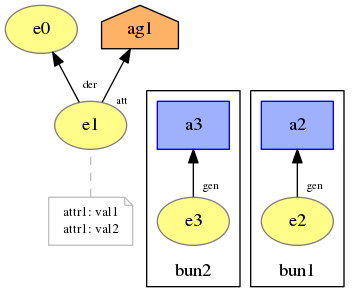 In the figure, we see that bundle bun1 contains a description of a2 generating e3. If in addition, we specify the -flatten option, merging and flattening operations result in the following document. As our applications generate provenance incrementally, bundles by bundles, the ability to merge documents and collapse bundles has become critical. This functionality is implemented by ProvToolbox in the method IndexedDocument.merge(). This tutorial has shown that it is also directly available from the command line, using the provconvert utility. 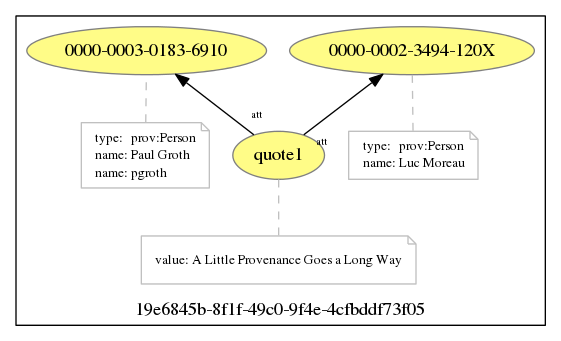 What form of processing do you regularly perform on your provenance graphs? Which functionality would you like to see added to ProvToolbox? Tell us, and for any other issue related to ProvToolbox, on the Github issue tracker. Building on the first ProvToolbox tutorial, the aim of this second tutorial is to show how to read a PROV document using ProvToolbox and export it to some format. We assume that installation instructions as described in the first Tutorial have been followed. Details about the Maven configuration can also be found there. The tutorial is standalone and a zip archive can be downloaded from the following URL: http://search.maven.org/remotecontent?filepath=org/openprovenance/prov/ProvToolbox-Tutorial2/0.7.0/ProvToolbox-Tutorial2-0.7.0-src.zip. The tutorial can also be found on the ProvToolbox project on GitHub. Beside the verbose logging by the Maven build process, the tutorial itself displays the following text, including some PROV expressed according to PROV-XML. The following Java snippet is extracted from the file src/main/java/org/openprovenance/prov/tutorial/tutorial2/ReadWrite.java. 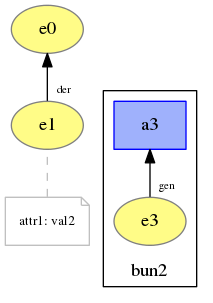 In line 3, it shows how a document can be read, given its path filein on the file system. In line 4, we see how a PROV Document can be saved into a file fileout. The writeDocument procedure determines the PROV format that is required by looking at the extension. If a non-standard extension is used, then the format can be specified explicitly, as in line 5, by one of the values of the enumerated type ProvFormat. For completion, line 13 shows how the tutorial class is initialized and line 15 takes care of invoking the conversion functionality. The tutorial is called from the command line, passing src/main/resources/a-little.provn as the input file, and target/a-little.svg as the output file. Therefore, the a-little.provn file is converted to SVG (by line 4) and to XML on standard output (by line 5). The following table lists the formats that are supported by ProvToolbox. For further documentation on the classes and methods used, Javadoc for ProvToolbox can be found from http://openprovenance.org/java/site/latest/apidocs/. The Javadoc documentation also refers to PROV specifications where appropriate. Suggestions for tutorials and also for ways of improving the programming experience offered by ProvToolbox are always welcome. Please raise issues on GitHub issue tracker.